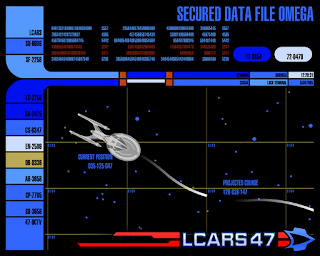 In the next update for version 5 (5.3), the app will lose all of the Intrepid class diagrams ready to support the new MSD plugins feature which will be required to be installed after you update LCARS 47. Tactical ship icons like the one pictured, will also reflect whichever plugin is installed and since it's now handled externally, the ship diagrams are even more detailed. Don't worry if you were a fan of the Intrepid class, it will be available for download as a plugin (see: full list). The Champaign update has also been applied to version 5.3, so it's now even more your own.